The Republican Party must focus its efforts to earn new supporters and voters in the follow in demographic communities: Hispanic, Asian and Pacific Islanders, African Americans, Indian Americans, Native Americans, women, and youth. This priority needs to be a continual effort that affects every facet of our Party’s activities, including our messaging, strategy, outreach, and budget. Unless the RNC gets serious about tackling this problem, we will lose future elections; the data demonstrates this. In both 2008 and 2012, President Obama won a combined 80 percent of the votes of all minority voters, including not only African Americans but also Hispanics, Asians, and others. The minority groups that President Obama carried with 80 percent of the vote in 2012 are on track to become a majority of the nation’s population by 2050. Today these minority groups make up 37 percent of the population, and they cast a record 28 percent of the votes in the 2012 presidential election, according to the election exit polls, an increase of 2 percentage points from 2008. We have to work harder at engaging demographic partners and allies. One outside group that has been particularly successful at engaging its community and increasing its Republican support is the Republican Jewish Coalition. We should incorporate some of its tactics in our efforts. By 2050, the Hispanic share of the U.S. population could be as high as 29 percent, up from 17 percent now. The African American proportion of the population is projected to rise slightly to 14.7 percent, while the Asian share is projected to increase to approximately 9 percent from its current 5.1 percent. Non-Hispanic whites, 63 percent of the current population, will decrease to half or slightly less than half of the population by 2050. In addition, the Republican Party lost youth and women voters in 2012. It is imperative that we reverse this troubling trend, as women represent the majority of voters and youth are future voters for decades to come. The pervasive mentality of writing off blocks of states or demographic votes for the Republican Party must be completely forgotten. The Republican Party must compete on every playing field. It is imperative that the RNC changes how it engages with Hispanic communities to welcome in new members of our Party. If Hispanic Americans hear that the GOP doesn’t want them in the United States, they won’t pay attention to our next sentence. It doesn’t matter what we say about education, jobs or the economy; if Hispanics think that we do not want them here, they will close their ears to our policies. In essence, Hispanic voters tell us our Party’s position on immigration has become a litmus test, measuring whether we are meeting them with a welcome mat or a closed door. President George W. Bush used to say, “Family values don’t stop at the Rio Grande … and a hungry mother is going to try to feed her child.” This tone, coupled with the longstanding relationship with Hispanics he built as governor, demonstrated to the Hispanic community that Republicans cared equally about all Americans. Because his tone was inclusive and his effort to build a relationship was long-term, Hispanic Americans were willing to listen to his principles and policies on education, jobs, spending and other issues. Hispanics want to know our Party wants no less for them than for any other American. They want to know that we are not just the party for those at the top of the economic ladder because our dream of a better life is for them, too. This path is still open to us; it was only eight years ago that President Bush received 44 percent of the Hispanic vote, a modern-day record for a Republican presidential candidate. It is encouraging that there are many Republican leaders both in the House and the Senate working on immigration proposals. As the party advocates for positive solutions on immigration, we will be more successful appealing to Hispanic voters on other issues. This includes policies the Republican Party has not really emphasized, yet which have especially high levels of support in Hispanic communities. Perhaps no policy demonstrates the depth of our Party’s commitment to all Americans as strongly as school choice — our promise of “equal opportunity in education” to all children regardless of color, class or origin. In addition, the RNC must improve how it markets its core principles and message in Hispanic communities (especially in Hispanic faith-based communities). These communities care about relationships, not just politics. Democrats have built relationships with Hispanics while Republicans have faltered. According to the listening sessions, Hispanics believe that Republicans have not had an effective Hispanic engagement program since President George W. Bush’s re-election campaign. We need to build a team that is one with the Hispanic community. Democrat organizations have successfully built a voter registration effort for new citizenship ceremonies where they register new voters on a weekly basis. Republican organizations have to duplicate this effort and build a strategic plan to register new American citizens to vote as Republicans. The RNC must put significant effort and resources into reaching out to Hispanic media and news outlets. This needs to be a high-level presence on all Latino media. The RNC must rebuild an updated, working list of Hispanic surrogates, not just RNC staff, to help carry and sell our message to the Hispanic community. The RNC should hire Hispanic communications directors and political directors for key states and communities across the country. On issues like immigration, the RNC needs to carefully craft a tone that takes into consideration the unique perspective of the Hispanic community. Message development is critical to Hispanic voters. The Republican Party is one of tolerance and respect, and we need to ensure that the tone of our message is always reflective of these core principles. In the modern media environment a poorly phrased argument or out-of-context statement can spiral out of control and reflect poorly on the Party as a whole. Thus we must emphasize during candidate trainings, retreats, etc., the importance of a welcoming, inclusive message in particular when discussing issues that relate directly to a minority group. The RNC should hire field staff within Hispanic communities nationally to build meaningful relationships. This cannot happen every four years but needs to be a continuous effort. Promote forward-looking positive policy proposals to Hispanic communities that unite voters, such as the Republican Party’s support for school choice. The RNC must rebuild a nationwide database of Hispanic leaders. The RNC must improve on promoting Hispanic staff and candidates within the Party. The GOP has substantial Hispanic elected officials at all levels, and we need to ensure they are being used as surrogates both in their communities and with the national media. At the staff level, the personnel should be visible and involved in senior political and budget decisions and not be limited to demographic outreach. Engage the Hispanic faith-based community in our efforts. 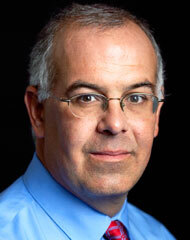 The RNC must rebuild a Hispanic surrogate list to promote a high-level presence in both Hispanic and mainstream media. Establish swearing-in citizenship teams to introduce new citizens after naturalization ceremonies to the Republican Party. 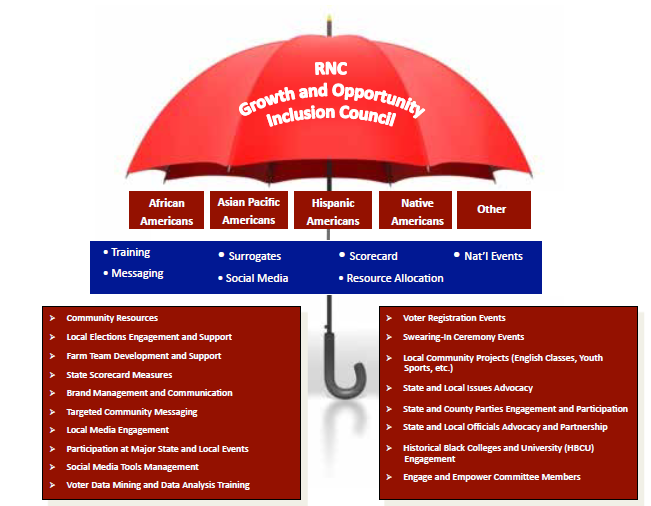 Consider how to help demographic ally groups flourish and sustain traditional partners under auspices of the RNC. The RNC should encourage individuals to participate in cultural organizations so that these organizations’ leadership is no longer dominated by Democrat-leaning individuals. The RNC must invest financial resources in Hispanic media. In a $1 billion campaign, much less than 1 percent of the total budget was spent on Hispanic or other demographic. group oriented media. At one point during the 2012 campaign, OFA was outspending us 8 to 1 in these media markets. If we are going to attract these groups to our Party and candidates, our budgets, and expenses need to reflect this importance. 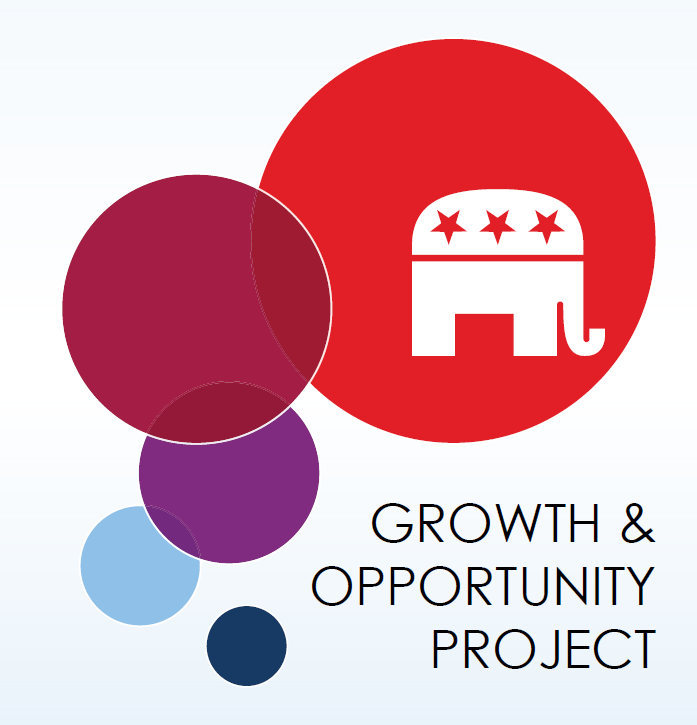 Develop an extensive network of Hispanic and other demographic groups’ political operatives that can help provide continuity for Republican political candidates around the country. The RNC and State Parties should make every effort to feature and use diverse committee members.